Discussion in 'UFC Discussion' started by Kung Fu bb, Aug 12, 2016. According to fightmetric Nate´s TD average is 1.22 per fight and his accuracy is 31%. And in my opinion all he needs is one takedown to wrap that up. He trains with A level grapplers like Kron Gracie so in my opinion it would be a good strategy point for Nate to train for a TD right off the bat or as an early counter to Conor´s early aggression. 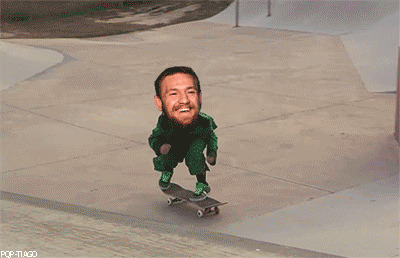 If he can get the TD, I don´t think Conor is getting back up... and if that doesn´t work go ahead and start boxing, but that will make Conor more hesitant to throw kicks or to commit too much on his punches. I think Conor will be going for that early storm in the beginning, so the TD could be a surprise element. What are your thoughts? He is a Diaz, he'll stand and Bang, until someone tries to take him down. groo, Exomag, JohnyBrabo and 20 others like this. LeBron, Chesten_Hesten, Haj01 and 7 others like this. Both guys are going to stand and bang, neither of them will try to make it a wrestling match. sirmorbach, Haj01, Gamer007 and 3 others like this. I agree. Dunno if Diaz wants to do it though. He is a good boxer & will probably want to see how that goes for him first. His easiest path to victory would for sure be to take it to the ground, but as Alan said, he will want to stand and trade, mano e mano. Such is the Stockton way. ALAN PARTRIDGE, JohnyBrabo, sirmorbach and 5 others like this. IIRC, Nate Diaz has won almost every fight where he's been taken down by an opponent. Or maybe the statistic is HIM taking his opponent down. Somebody should know this. Conor's guard is mostly defensive & so taking him down is the safest place to be in a fight with him. He beat the sh*t out of Nate in the first 8 minutes on the feet. If Nate would prefer not to experience that again I would suggest a takedown. Mac's takedown defense is pretty stellar, so it will not be easy... but if accomplished, it could make for a fight changing opportunity. HI SCOTT NEWMAN, AliBagaooteenov, BC and 1 other person like this. ALAN PARTRIDGE, Haj01, ArtOfDrowning and 9 others like this. I think he is not just gonna bang for the sake of banging like Lineker for example, there´s tooooo much at stake now and losing can make a big difference in terms of money, so I think he´ll come in smart.... he might just start by being cautious because he already said he is a slow starter, like Cerrone. But Diaz is smart, he learned from the first fight so I believe he is not gonna start slow because he knows Conor is an early agressor, that´s why I thought about the early TD... aaaaand it would embarrass Conor even more if it happened this way and he wasn´t able to land anything and got finished. i'd be pretty surprised if nate got an early takedown. i see a stand up back n forth for two rounds. IF nate were to get a take down it would be in the later rounds by a hip toss against the cage or something. Exactly. If I was Nate Diaz I would go for a takedown asap. JohnyBrabo, Cro Cop Is Back and Kung Fu bb like this. AliBagaooteenov, 84percentcool, Cro Cop Is Back and 1 other person like this. PabloMEX and Cro Cop Is Back like this. This is so true, 1000 percent true, early takedown means Conor's getting his face punched in while trying to escape submissions for four minutes. He's fucked on the ground. There's no way he's getting up. it's just survival mode. If Nate keeps his hands up (he won't) he can make this an easy fight. My prediction is, he will wear McGregor out on the feet and maybe hurt him in the third, takedown, sub. Nate will also get hurt. It will be an exciting battle, I'm so sure about this. Yeah, the picture is of him doing that to Gray Maynard, but first he hurt him on the feet like you said. 84percentcool and Kung Fu bb like this. "He beat the sh*t out of Nate in the first 8 minutes on the feet." Actually that is the narrative that Conor Mcgregor is selling you. Nothing happened the first 3 minutes of the fight. Conor had a nice stretch of 4-5 minutes starting at the end of Rd 1 into the start of Rd 2. This doesn't mean much in a 5 round fight when your opponent didn't even have a training camp for the fight. El_Dyablo619, conorbless1, Myrddin Wild and 1 other person like this.